Prince Harry today marked the start of the 100-day countdown until the 2015 Rugby World Cup by launching a trophy tour at Twickenham stadium – and having his words broadcast to the crowds in Piccadilly Circus. The Prince, 30, made a speech in front of a few hundred fans assembled at the stadium as he was joined by rugby stars Jonny Wilkinson and Will Greenwood. He then launched the UK-wide tour of the Webb Ellis Cup – marking the final countdown to the start of the tournament on 18 September. 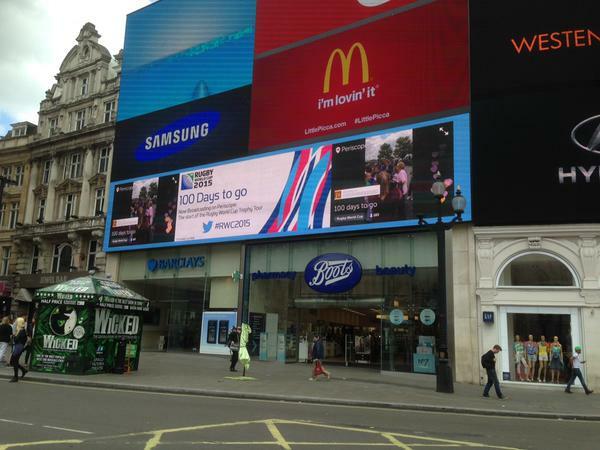 The royal’s words were streamed live to the Piccadilly Lights, the giant screens in central London, via Periscope – Twitter’s video streaming site. It was the largest ever Periscope video stream in the UK and was also the first Periscope from the official @rugbyworldcup account. Prince Harry said: “This is a very exciting day – it is 100 days until the start of the Rugby World Cup. We are here today to send the Webb Ellis Cup around the country, giving rugby fans across the country the chance to play their part in the run up to the tournament. “Rugby is a game of values. Respect, pride, teamwork, discipline. In 100 days’ time at this incredible festival of rugby the best players, teams and fans will be demonstrating these values. “As we have shown through the Olympics, the Common Wealth Games and the Invictus games, we are a nation of great hosts that seize the moment. The world will be expecting us to deliver. We will not disappoint. I have no doubt that the British public will make every nation feel at home and provide the best possible welcome to all 20 teams and the hundreds of thousands of fans coming to UK. Following his speech, the Webb Ellis Cup was placed into a jeep and the tour started with Greenwood travelling to Scotland along with the trophy.